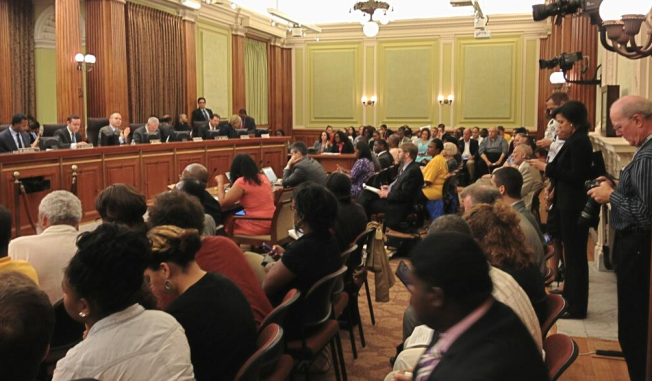 The D.C. Council did not have enough votes to override a mayoral veto and require Walmart and other large retailers to pay their employees a "living wage" of at least $12.50 per hour, News4's Tom Sherwood reported. The council approved the bill in July on an 8-5 vote. Mayor Vincent Gray vetoed it last week. The council needed nine votes to override the veto but got only seven this time, Sherwood reported. D.C. Council soon will move to raise the minimum wage for all D.C. workers, but by how much and when remains to be determined. "Other billion-dollar corporations, Apple, at what point do we craft legislation just for Apple, then Walgreen's, then Burger King, then McDonald's," Councilmember Tommy Wells said. "The way to do it is a fair wage for all." "We agree with that," said . "We think it's the right thing. I don't know whether it's $10.25, whether it's $10.50, whether it's $9.50, we just need to look at that." The bill put Washington at the center of a national debate over compensation for low-wage workers and whether certain companies should be required to pay more. Gray, a Democrat, called it a "job killer" and said it would drive away Walmart and several other retailers. Large retailers were classified in the bill as those that have stores of at least 75,000 square feet and whose parent companies have sales of more than $1 billion annually. Executives with several major retail chains, including Walmart, urged the mayor to veto the bill. Walmart even warned it might not build six stores - now down to five after the owners of the land slated for the sixth terminated their deal with the developer because another retailer decided to build elsewhere - it planned for the District if the bill became law. "We applaud those Council members who rejected pressure from special interest groups to do the right thing by their constituents," read a statement from Walmart Senior Director of Communications Steven Restivo. "We look forward to being part of the solution in communities across D.C., especially in areas east of the river that have been traditionally overlooked by major retailers, when it comes to creating jobs, economic development opportunities and more affordable shopping options in Washington, D.C."
At-large Council member David Catania, a potential swing vote, said the Walmart bill wasn't the way to end poverty wages in D.C.
"We are disappointed that Mayor Gray and Councilmembers Wells, Catania, Cheh, Bonds, Bowser, and Alexander have sided with Walmart and corporate lobbyists rather than the hardworking people of our city. Today’s events show that many of our elected officials are not leaders. They had to be forced by an overwhelming push from residents and workers to propose even modest improvements in the minimum wage. Big corporations like Walmart – with more than $16 billion in annual profits – can and should be paying a minimum of $12.50 an hour to workers who are making the company a success. DC voters believe that City Council and the next mayor should be fighting to bring better jobs in the city, and we're prepared to stand with leaders like Phil Mendelson and Vincent Orange who won't back down to corporate bullying." The city's current minimum wage is $8.25, a dollar more than the national rate.